Und zwar funktioniert einerseits die Slideshow nicht. Es wird nur immer das Bild nr. 4 angezegt. Zweitens habe ich das Problem, dass ich im Ordner Slideshow alle Bilder gelöscht und ersetzt habe. Trotzdem wird immernoch das gelöschte Hausbild angezeigt. Der Link des Bildes behauptet, es sei in ebendiesem Ordner. Doch wie gesagt, dort gibt es das nicht mehr. Cache hab ich auch schon gelöscht…. Bei uns und auch bei den anderen Usern funktioniert die Slideshow perfekt. könnte es daran liegen, dass ich die 1.7 version verwende? Hallo, ich hab das gleiche Problem könnt ihr mir verraten wie ich das lösen kann ? Ich hab das zum test auf meinem Laptop über xampp laufen da geht es aber jetzt hab ich es auf den Server geladen da geht die Slideshow komischerweise nicht, wird immer nur das vierte bild angezeigt. The slideshow is not working for mi neither. How it must to be configured? Is it like a module? Where can i find it? Looks like it works for some people and it doesn’t for other. Are you sure you are using J1.7? I will take a closer look to this problems guys. First of all – congratulations, indeed one of the best free Joomla Templates. I’m having an issue with the slider, I have worked with it in the past with other websites and it works great. For some reason I can get it work on this template, I reviewed the code of the index.php and everything looks fine and the slider.js looks fine as well. However it only shows me image #4 and the slider does not work. Any ideas that might help me? Thanks! Hallo, erstmal danke für die großartige Arbeit! Es funktioniert alles super aber ein Problem habe ich: Kann ich die Slideshow auch nur bei bestimmten Beiträgen anzeigen lassen oder ist dies nur für alle Beiträge möglich? Oh yeah, nice update…. slider is working perfectly now. Also, thanks for the settings.js, it makes it a lot easier to remove the caption & thumbs. Any way to only get the slideshow to display on the home page? I want the slideshow on the home page only. Thank you guys first, this theme looks so great. For some reason, I only want the slideshow show on the homepage, and hide on other pages, is it possible? And is it possible add a link to the image? Therefor user can link to any article if they click the slideshow. 1.) Is there a way for me to have the image gallery only show on ‘Home’ page? how can I use this awesome template of yours but use the Showplus instead? I have tried assigning the showplus to slideshow div but never shows up. It seems this template is not compatible with IE. anybody can solve this ? Hello, I love this look and feel. I appreciate the free template. Only one complaint. How do I disable the slideshow after the home page. I do NOT want it on every page. If you have a suggestion I would love to know. But thanks again for this. Is it possible to configure where the slideshow appears? Nope. We are working on it. what a great template!! LOVE IT!! I also had that same problem too but managed to solve it 🙂 …. Originally I uploaded it via FTP (Filezilla) directly into the templates folder n I was gettin the slider error… I then deleted the template n uploaded it via the extention manager (as recommended 😉 ) and since then it been problem free!! I have the problem that the Main Menu´s dont show… I have published them an I even have the originals in there (which are also not showing). I have deleted and re-installed the Joomla itself 2 times now… can someone please help?? I having some troubles with the horizontalmenu, it shows only 1 submenu items. I want more submenu’s. it’s not possible to change name for Slideshow 1 description ? Change the description in the template parameters. So what is the solution to getting the slider working? I don’t want to reload the template with an updated version as I would expect that it would change all of the tweaking that I have done. Please contact me with the exact problem. How to change encoding to utf-8 to template? Is there something in the css different, or blocking lists display ? I’ve looked at the hmtl source code and the balises il or ol are present, so i think the problem should be the css. Sorry but i’m a beginner and css style is not in my skills. how can i order contacts in one category? Got a problme that it seems not compatible with IE. Is there any update to fix it? Love the template – any chance a second field can be added in the Template Manager Basic Options to assign an article id to the rotator so that the slideshow clicks through to an article? You can simply add a link to any article in our latest template. I re-installed the latest version via the download link – can you explain where the article links can be assigned to each of the four large rotator images? I guess I expected to see them in Template Manager: Styles next to where you define the large images text. Do I need to manually edit one of the source files? I didn’t see any references in the rotator.js file. Hi would you be able to explain which code should I delete to remove small images from the slide show plese. love the template, and have done some slight changes. using joomla 1.7, however there are a few tricky lil things I’ve run into that are bugging me. Firstly, I cannot seem to change the font size/family (edited style.css) changed sizes and family, nothing seems to change it, cant figure out why or where to do this. Also, I happen to be having some trouble with tables. I have a table in an article that I set to have a specific width or cell padding, which shows up fine viewing in the article manager (tinymce), however on the actual site itself, it doesn’t change. Any ideas, or is this a problem with joomla/tinymce? Hi again, The main menu already appear but the drop down menu doesn’t work, can you help me with this situation? I liked the real estate theme. The template does not seem to be compatible with Internet Explorer. Any update on the IE issue? What is not working? It works fine for me. can you explain where the article links can be assigned to each of the four large rotator images? Hi, how do I replace the images in the slideshow? How can I get to the slideshow folder? Und zwar habe ich ein Menu oben rechts, welches ich auch dieser Position zugeordnet habe (“top”). Wenn ich meine Seite nun aufrufe, bekomme ich aber nur eine Liste angezeigt und nicht das designte Menu, wie es hier in der Vorschau zu sehen ist mit den Einträgen “Joomla.org”, “Home”, “Sample-Sites”. Wie kann ich das ganze Beheben? Außerdem ist mir aufgefallen, dass das Template unter dem IE nicht wirklich funktioniert (IE6 bis IE8). Hat sich erledigt…das Menu liegt nicht in der Position “top”, sondern in der “position-1”. The template it’s almost perfect. I’ have just asmall problem. I test SobiPro with more template and work fine, but on this template..on details , the menu it’s on the left like vertical link’s ans the Photo gallery opning wrong. My English it’s not so good, so I will put a video to understand my problem. You can see the blue template that work fine. I’m on stand by because of this insue. hello, the template works great, im really happy with it. my only problem is that i cant manage to change the tittle of the home page from ¨Real Estate Manager¨ to ¨mywebsite¨ in the homepage. its been a couple days since im looking for the answer. can you please help me with this situation? On IE the shadow effects of the template do not work. Is there a solution? I loved this template ! It’s amazing … I’m trying to use this in my website and i just have a problem, my drop down menu doesn’t show more than 2 levels … Anyone have this problem too? The slideshow does not run, remain fixed to the last image. 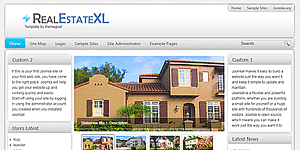 I downloaded the template from http://www.joomla.it/guide-e-video-guide.html?start=505 realestatexl-et. I’ve installed the realestatexl theme for my website (i actually always test it in local – my site is not visible on the internet). Could you help me to resolve the problem?? ?